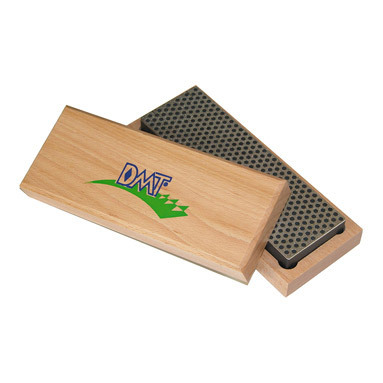 8" Diamond Whetstone sharpener with mounting tabs provides larger surface area to accommodate wide range of edge needs. Extra-Coarse diamond (60 micron / 220 mesh) for when significant removal of material is needed for a damaged edge. Excellent gift with Hardwood case for easy counter or bench use; larger, wider diamond surface for sharpening a variety of knives and edges. This model includes a beautiful hardwood case; includes non-skid rubber feet.